Now please remember, I had never run a race farther than 3.1 miles. The farthest at that point I had run was 6 miles. Now I was signed up for TWO marathons, back to back months. Marathon training began late May. I was very thankful for St. Louis – there was plenty of various trails to run on to help keep the scenery fresh. 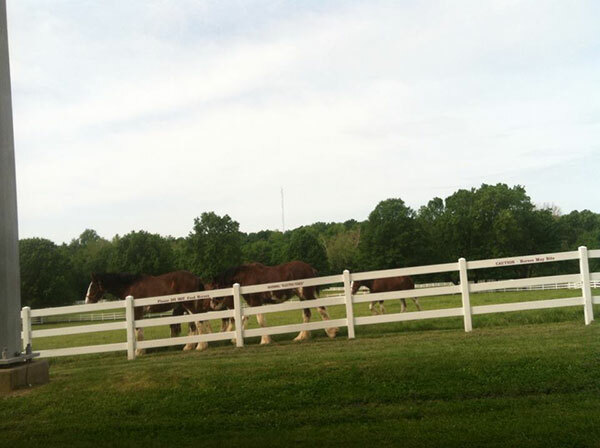 Sometimes I was out running by the Clydesdales and other times I was out in the middle of nowhere surrounded by trees. The miles started racking up and my Saturdays started getting very full of running in the morning and then chilling out the rest of the day afterwards. September came and it was Sioux Falls Marathon time. You figure Sioux Falls, South Dakota, it’s up north… It’s September. It’s gotta be decent temperature wise, right? I began to realize I had ONLY run half of the race by mile 13 and started to feel the pace. I ended up dropping my speed a bit and watched the pace group run off without me. Later in the run I was blessed with temperatures up in the high 70s and humidity to go along with it. I was dying from the heat and my overconfidence earlier in the race. I hated myself at mile 20 and found myself starting to walk. …Only to find out she knew what she was talking about. My legs were tired, and were NOW starting to cramp up from walking. Why did I sign up for a full marathon again? Eventually I was able to get back into running around mile 23 and started passing a few people up. I noticed even the heat had gotten to some much faster pacers, who were dragging behind their original goals. I remember getting to mile 25 and seeing my mom who had come with me along with my grandparents at a turn and hearing them cheer for me. That gave me my 6th (or 7th? I can’t remember) wind to get me to the finish line. God it felt so good to cross that finish line… And sitting down on a curb. And then feeling terrible trying to get back up so we could get to the hotel. I began regretting that evening signing up to do the full marathon in St. Louis. I remember talking to my mom about it, especially when I had the infamous ‘marathon walk’. She gave me the sage advice of thinking about it for a few weeks before deciding. And so, I got back to reality the next week, slowly being able to walk normally again. The following week, I was able to get in a few miles here and there. Much slower than usual, but I could run again without hating myself. A few weeks later, after a longer run here and there, I decided… Hey, what the heck. I’ll give it one more go. So training boosted back up for my second marathon in three weeks. Thankfully I knew a few running coaches that were able to help me get back to where I needed to be safely. 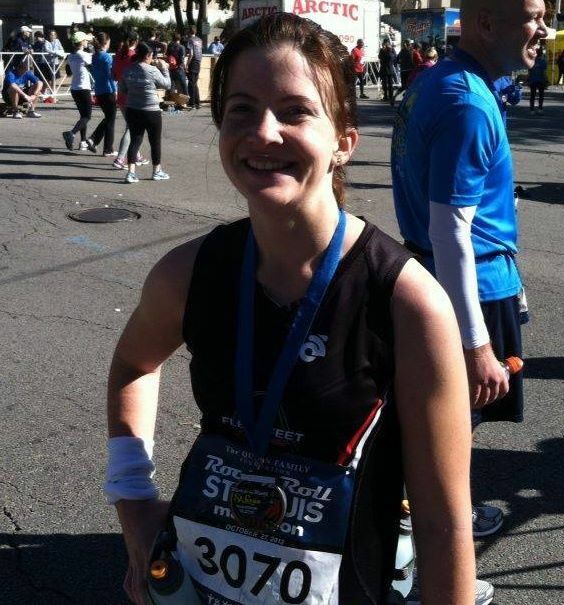 At the end of October I ran the Rock n Roll St. Louis marathon, and I enjoyed it. I took the lessons I learned from Sioux Falls, listening to my body and not gunning for such a fast finish time. It was a much cooler day, weather wise, and I was able to enjoy running with the pace group I stuck with with no humidity. I remember around mile 23-24 running into one of my runner coach friends, and him calling out to me, asking me how I felt. “Great” I replied back to him. “Good… Then go faster!” Coach Cary yelled back. What? The pace group leaders also pushed me. 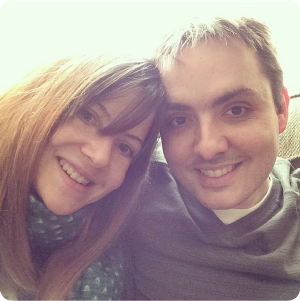 At first, I thought they were all crazy… But I felt like I still had something in the tank. So I pushed myself. And thanks to them I went from a 4:39 finish in Sioux Falls to a 4:12 in St. Louis (St. Louis also having way more hills). And that’s when I fell in love with the marathon. 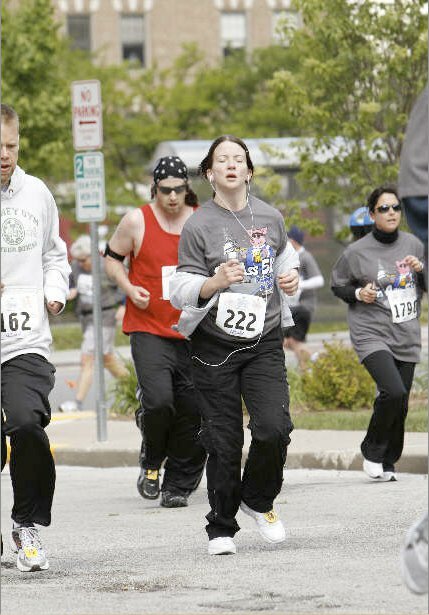 Since then I’ve done two more marathons: my own special 26th birthday marathon and the Springfield Marathon. Chris has been such a great cheerleader to me in both of those races, cheering me on from the sidelines to being there at the finish line to catch me when my knees buckle. I’ve also fallen in love with racing. My competitive spirit thrives when I cross the start line and I want to beat my previous self time and time again. Sometimes I do… and sometimes I don’t. But my love for running has never wavered and I hope to grow old with her. You know how sometimes people will ask you “How did you two meet?” when they first meet with your and your significant other? They’re expecting something romantic, cheesy, and fun. My relationship with running kinda started off that way. It’s funny, when I was a child I hated P.E., and hated running even more. I loathed the time of year that we were forced to run a mile for the school’s state performance. Most of the time I sneakily walked when the coaches weren’t watching, but once and twice when I was caught and forced to run, I gasped for air as I watched my more athletic classmates run with ease at a much faster rate. I was so thankful when high school was over and I was never forced to run a mile again. 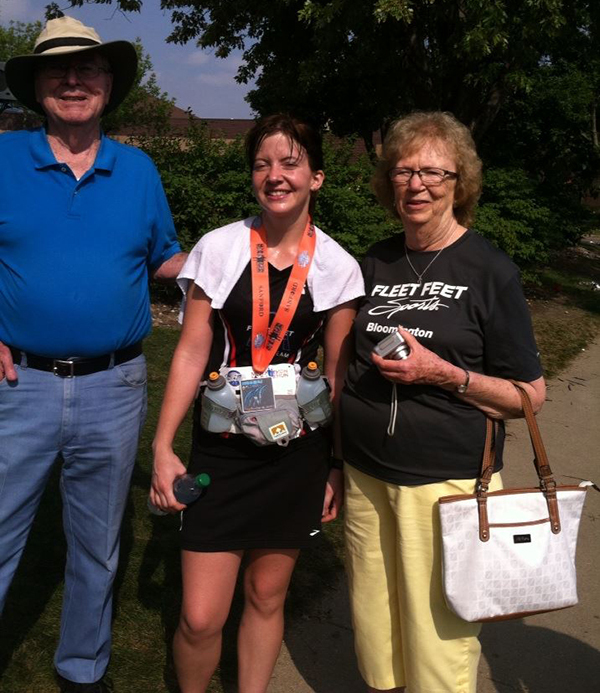 Fast forward a few years later, 2010, when my mom approached me asking if I wanted to do a 5K. About that time I was also trying to get into better shape with diet and exercise. 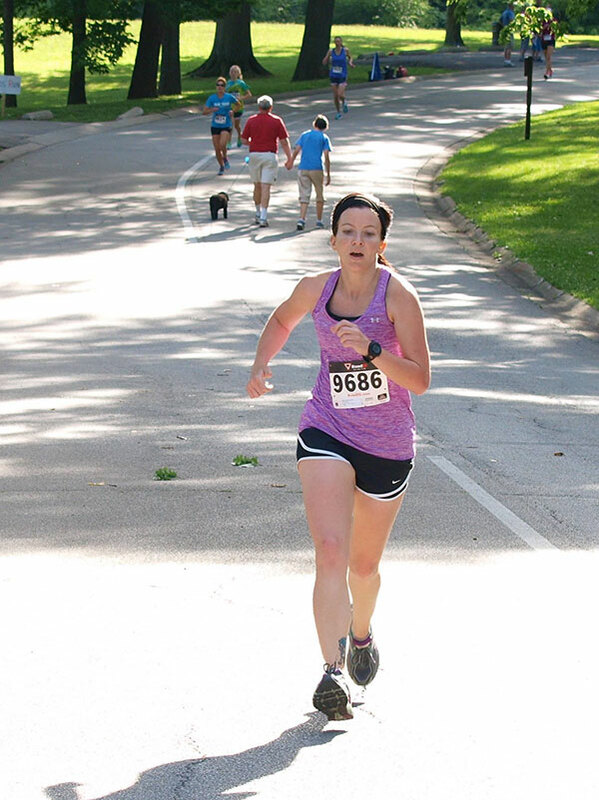 I knew I hated the mile and wasn’t sure I wanted to get back in the ring… But when I found out the race had a few food stops (donut holes, ice cream, etc), I decided why not. I could run and earn those sweet treats! While training for my first race, I loved the treadmill. It forced me to run, but I could also control how fast I was going. There was no real training plan I followed – ran a bit, walked when I had to, then got back into running. I remember being so happy when I could finally get to run 5.5mph for 30 minutes without stopping or feeling like I was dying! Race day I geared up and started running when the start gun shot was fired. Thankfully I had a family member that started running with me, which helped keep me motivated. I found out very early on in the race that eating during running was a very dumb idea and ate only one donut hole. I was also not the best dressed, coming from a family that really didn’t run either. However that didn’t stop me from giving it my all. I finished with an official time of 31:00, averaging a 9:59 minute mile pace. I was dying at the end, and incredibly tired, but also super proud as well. I ran a whole 5K without stopping! High school me would not have believed it. So, obviously the running bug bit me and I kept running, right? Wrong. It was a great race, but I ended up sticking with the bicycle and gym. It wasn’t until I finally got into college that I started running along with weight lifting after reading somewhere about how a bit of cardio would help keep me lean. I remember it was early Spring… 2012? I started back up with a mile or two here and there and ran around campus. Slowly my mileage started racking up to 5 or 6 miles. Except for a turkey trot, I wasn’t really training for any races. It was all about staying fit. It wasn’t until I graduated and moved into St. Louis in 2013 that things changed. 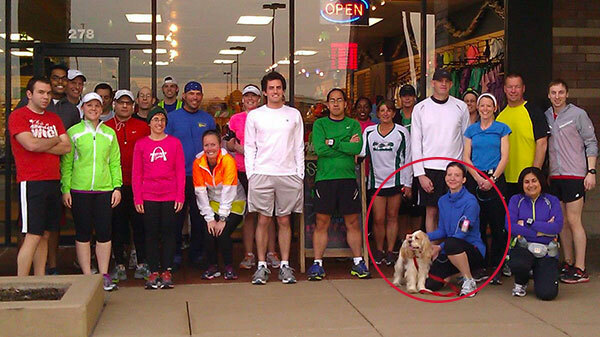 I found FLEET FEET St. Louis, a running store that has group runs once a week with pizza and beer at the end. It was there I made runner friends and really began getting into the whole running thing. I even ended up working there as their Graphic Designer! As a worker, I learned a WHOLE lot about running do’s and don’ts. I found out about running apparel, and how wearing the right things like synthetic material makes running a whole lot more comfortable. I learned about the different types running shoes; neutral and stability… And found out I was wearing the wrong shoe and needed to have some stability. My new runner friends also started getting me interested in running races. I made the resolution to run the 2013 St Louis Rock and Roll Half Marathon. Then a runner friend pushed me to run a full marathon. Why not? So I signed up for my first marathon in September. Then in the beginning of April, the Boston Marathon bombing happened. I had gotten word that my uncle, who had been in the race, wasn’t far from where it had happened. That really got me going.